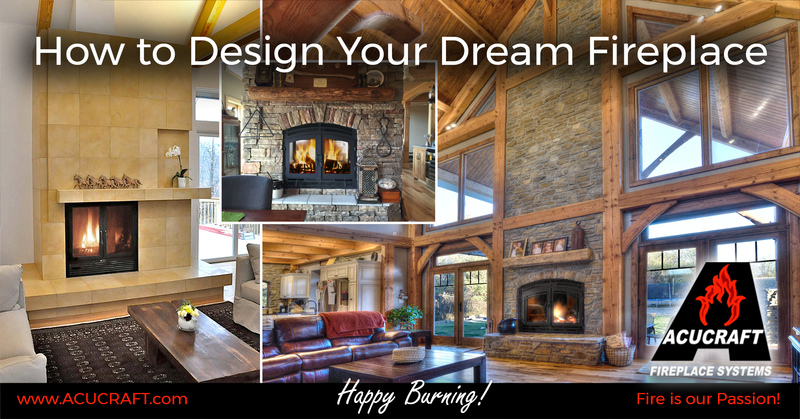 Dreaming about a new wood-burning fireplace for your home or cabin? Whether you’re looking for a traditional and rustic or modern and contemporary wood-burning fireplace to warm up your home or cabin, Acucraft Fireplace Advisor Mike Hannan shares some handy tips to consider while you plan for your dream fireplace. Many people get focused on the size of the fireplace opening. This is major dimension to consider, but keep in mind you’ll need additional room for the trim or face frames that border the fire viewing area. Another space consideration is for the concealed connections to either side of the fireplace. Remember to add this to the overall framing width of the fireplace. This dimension will help you determine the finished facing material along each side of the fireplace opening.” (See image below). For example, the Acucraft wood-burning Hearthroom 36″ fireplace door opening is 36-inches wide x 21-inches tall. The black face frame is 41-¾-inches wide. This gives the fireplace an even larger appearance beyond the door opening. In order to fit this unit into a seven-foot wide chase, you will need about 22-inches of stone to set on each side of the fireplace face. Rendering of an Acucraft Hearthroom 36 ST wood-burning fireplace with a seven-foot chase width showing a good ratio of 1/3 of the open fireplace face to either side. If you have less width and use less facing material either side of the fireplace face, the overall fireplace looks out of proportion. Acucraft Hearthroom 36 ST wood-burning fireplace with minimum chase width of 58 inches. Next you’ll need to choose the type and size of facing material to finish your fireplace surround. Stone, tile and brick are common materials used. Select a material size that can be set in multiples to avoid a single material placement (or worse a sliver of material to complete a row). This will create a consistent, seamless look for your fireplace surround. Accommodating room details such as cabinets, windows and trim: If you’re fireplace fits between windows, trim or built-in cabinets, keep the size of the fireplace in mind to ensure all heights align and tie the room together. Ceiling height: Consider the ceiling height. If you have a 20-foot ceiling, you can select a taller fireplace size than if you had a room with an eight-foot ceiling. For every inch you raise the fireplace off the floor with a raised hearth, the mantel clearance will also move up (example: If an Acucraft Hearthroom 36 wood-burning fireplace is set on the floor, the minimum mantel height would be 52 ⅛-inches from the bottom of the fireplace. Now, if the fireplace is raised 12-inches, the mantle height would be 70 ⅛-inches from the bottom of the fireplace). If you’re planning on installing a TV above the fireplace, you’ll need to follow the mantel clearance for each model. Acucraft contemporary and traditional fireplace styles shown with various hearth heights. Wood-burning fireplaces require a hearth, whether raised or in-floor to protect the area around the fireplace from combustibility. There are some clear advantages in choosing a raised hearth. Wood fireplaces are commonly built with raised hearths and for good reason. To start with, a raised hearth provides a cozy place to sit and enjoy the warmth of your fire. Secondly, a raised hearth is a convenient place load a fire and to store wood and fireplace tools. Finally, envision the view from various places within the room. A raised hearth showcases the fireplace by offering views from anywhere in the room and the fireplace is at a comfortable eye-level for viewing when you or your guests are seated. Fireplace opening size: A smaller fireplace looks better with a raised hearth. A larger fireplace looks better when it is positioned lower to the floor. Ceiling height: Consider the ceiling height. If you have a 20-foot ceiling, you can raise the fireplace higher than if you had a room with an eight-foot ceiling. Your height: When loading a fireplace or starting a fire, a raised hearth provides a place to rest your knee while loading the fire. The most common hearth heights are from 12” to 18”. If you’re tall (over six-feet), choose a higher hearth size. The same thing goes for sitting on the hearth, if you’re shorter, choose a lower hearth height. Acucraft offers 27 turn-key wood-burning fireplace models, along with many finishing options, to give you endless choices and fit seamlessly within your home or cabin. Acucraft Hearthroom Series wood-burning fireplaces offer a rustic and traditional look while the Acucraft Unity Series wood-burning fireplaces provide a modern, clean-face appearance for contemporary spaces. If you’re looking for whole-home heating or supplemental heat, then the Acucraft High-Tech Series wood-burning fireplaces are your perfect choice! Custom wood-burning fireplace options are also available. The Acucraft Fireplace Advisors and Designers will work with you one-on-one to help you find the best fireplace solution for your commercial or residential space. Hopefully these tips will help you design the fireplace of your dreams within your space to last a lifetime of enjoyment. Learn more about Acucraft wood-burning fireplaces and start your own fireplace journey. Speak with one of our Fireplace Experts today: 888-317-6499 or email info@acucraft.com! Acucraft Fireplace Advisor Mike Hannan has over 16 years expertise, advising and installing fireplaces. For 39 years, Acucraft has been designing and manufacturing one-of-a-kind wood-burning and gas fireplace systems. Whether you’re looking for a wood-burning home-heating solution or a modern see-through gas fireplace, Acucraft has a fireplace to fit seamlessly within any residential or commercial space. Start your fireplace dream today, talk with an Acucraft Fireplace Advisor by calling toll free at (888) 317-6499 or email info@acucraft.com.